Welcome to the NBA Live 96 portal! 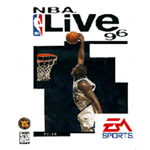 This is a central hub for all the NBA Live 96 content here at the NLSC including news, reviews, feature articles, downloads and more. In this week's Wayback Wednesday, Andrew revamps a couple of mods for NBA Live 96 for old time's sake, and reflects upon the experience. Download an NBA Live 96 Genesis ROM hack featuring updated 2019 season rosters, in today's File Additions.